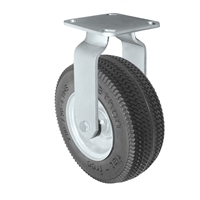 Home > PNEUMATIC CASTERS > FOAM FILLED - Plate Size - 4" x 4-1/2"
Eliminate Maintenance compared to a Air Filled Pneumatic Caster and Wheel - Flat Free Foam Filled Tires never go flat and require zero maintenance! 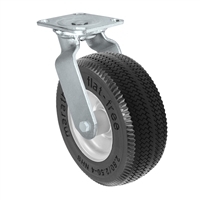 •	Wheels are made from closed cell Micro-cellular polyurethane foam and offer the same advantages of as a pneumatic tire without the possibility of leaking air out. •	Provides shock load protection and a smooth cushioned ride, rolling easily over debris and small obstacles. •	Wide, soft tread face is ideal for rolling on grass, sand, dirt, etc. •	Both black and gray wheels are non-marking. •	Available with precision bearings that offer maximum roll-ability and are maintenance free. •	Saw-tooth tread design offers both traction and maneuverability.